The latest CD album experience from Robert Robinson dedicated to spreading a message of love and comfort to all. Lullabies from the Heart seeks to bring inner strength to people with a breathtaking musical experience. When choosing songs for the album, we sought songs that touch people’s hearts and bring them love and comfort in a way that only music can. Robert chose Tears in Heaven for Lullabies from the Heart, because the song speaks to the universal, human experience of loss. Eric Clapton wrote Tears in Heaven in the early ’90s after a tragic accident that killed his infant son, Conor. Clapton poured his emotions into the music and lyrics, and Robert has done the same with his vocals. Part of the mission of this project is to bring relaxation to anyone who may have trouble calming their mind: from the tiniest baby, to the person who just can’t seem to get to sleep at night. How do you relax at the end of a long day? This team came together with one goal in mind: to reach out across America and change people’s lives with Robert Robinson’s music. That’s why Lullabies from the Heart with Robert Robinson is an experience. Music can lift your mood. It can turn your day around. It can even lull you away into a peaceful place where there aren’t any smartphones or stresses. No matter what you need, you can find strength through music. Lullabies from the Heart with Robert Robinson has a song for every moment. From favorites you know to a few originals, these songs will blow you away. And that’s just the music. You can’t forget the passion and emotion that Robert puts into every song that he sings. So, help spread this message of love and comfort to your friends and loved ones. Because even from miles away, this music will embrace every person who needs it. Off to a great start! In just one day we reached 10% of our funding! Clearly we have a long way to go but we still have 23 days. The great start just demonstrates to us that the people who know and love us are here to support us and believe in our mission to share songs of love and comfort. The next steps are to keep sharing the Kickstarter link with your family and friends. In order to really make this project a success we need to reach 100% funding. Thanks for supporting the lullaby revolution. Our Kickstarter campaign has launched and we now have only 24 days to raise $22,000 in order to pay these artists for the amazing work they have done. Help Robert make his dream of reaching out to each and every person and embracing them with his music. With a gift of just $35 you can become part of the team and reserve your copy of the album. But we need your help with more than just the money. We need you to share this with the people you love, your friends, your co-workers, and even people you don’t know. Everyone feels sad and lonely at times, but this album can empower people and offer strength through music. 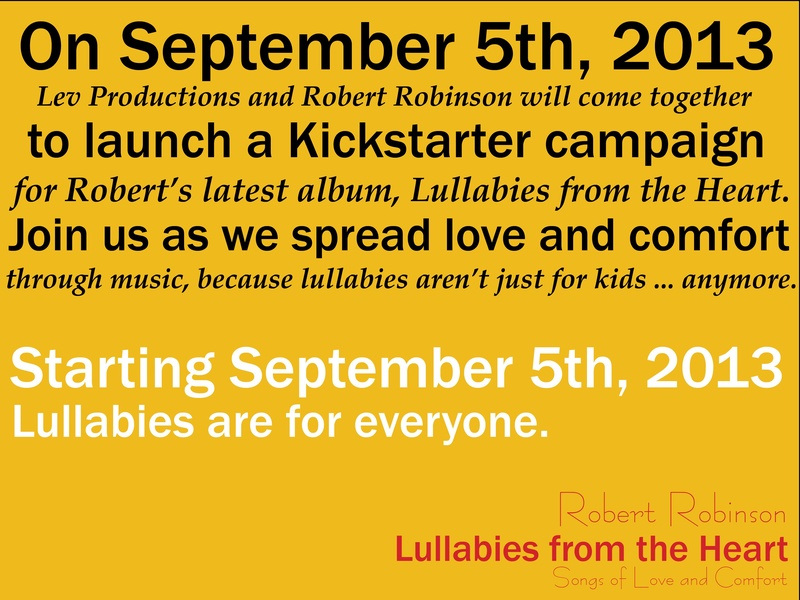 The Lullabies from the Heart with Robert Robinson Kickstarter campaign launches tomorrow! Starting tomorrow you will be able to hear the music that will change the world. But you can join in the fun starting today! Follow us at LullabiesfromtheHeart.com before midnight tonight to be entered for a chance to get an exclusive download of Robert’s new single, “Through His Eyes.” 5 lucky winners will be picked! So spread the word, show your friends, and send it out on your Facebook’s, Twitters and emails. Robert’s voice needs to be heard, and only you can make it possible! We’ve been talking a lot about Kickstarter for the past few days, because our project Lullabies from the Heart with Robert Robinson is launching a Kickstarter in JUST 2 DAYS! Kickstarter is a way for fans to connect directly with the projects that are interesting to them. By pledging, individuals can help creative projects get off the ground in exchange for early releases, final copies of the project and extra incentives offered only to those who pledge. All you have to do is become a “backer” with Kickstarter, and you can fund creative projects from all over the world. You can choose what level you want to give at, and each level has a special gift of gratitude. After you pledge, share it with your world! Tell everyone you know about the project you believe in, because if we don’t reach our $20,000 goal on Kickstarter.com, we don’t get any of the money that is pledged to us, and you don’t get any of the fabulous incentives you were promised. Kickstarter is all about crowd-sourced funding, where people from different parts of life all come together to make someone’s dream become possible. The day is almost here. On September 5th, you will be able to join with Robert Robinson as he sets out to soothe souls across America with 10 songs that he has called lullabies from his heart. But these aren’t your average lullabies. To Robert, a lullaby is anything that can bring a sense of peace or calm to the listener. Who says that babies are the only ones who need relaxing music? 25 Days. $20,000. 10 songs. 1 Dream. We live in a world that demands more and more of us each day, leaving many of us feeling exhausted, anxious, or just plain overwhelmed. This album will be a much-needed break from the chaos, offering rest to each and every person it touches. By joining the Kickstarter team, you will receive gifts of gratitude: everything from signed photographs, a phone call from Robert, tickets to the CD release concert and copies of the album. Most importantly, you will become part of the movement that helps bring this message to the world. Follow us to get regular updates about the project, and don’t forget to check out our Kickstarter page on September 5th! Lev Productions spent the afternoon with Robert Robinson in MasterMix studio at the Institute of Production and Recording in Minneapolis, MN recording the first set of tracks for Robert’s new album Lullabies from the Heart. This album hopes to show a softer side of Robert Robinson, allowing him to use his voice to lull his fans. Although our team of professionals have been working on the music for more than a month, the music has finally come to life with the voice of “God’s canary” himself. But Lullabies From the Heart is bringing out a whole new dynamic of Robert’s powerful voice. Lead sound engineer at Green River Recording and student at IPR in Minneapolis, Chris Tianen, describes Robert’s vocals as “the perfect mixture of tension and release.” Chris, who studies under Scooter, assisted in the studio and will be working on the album with Lev Productions in the coming months. The moments in the studio were pure magic. They brought a new vigor to the team. We cannot wait to get back in the studio later this month. This is the first of many updates for Lullabies from the Heart with Robert Robinson. Sign-up to follow our blog and receive email updates from our team. Enter your email address below to become part of the movement. You will get e-mail updates and a special look at Robert Robinson's latest project.